Abstract. Royston and Parmar (2002, Statistics in Medicine 21: 2175–2197) developed a class of flexible parametric survival models that were programmed in Stata with the stpm command (Royston, 2001, Stata Journal 1: 1–28). In this article, we introduce a new command, stpm2, that extends the methodology. 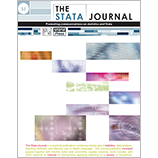 New features for stpm2 include improvement in the way time-dependent covariates are modeled, with these effects far less likely to be over parameterized; the ability to incorporate expected mortality and thus fit relative survival models; and a superior predict command that enables simple quantification of differences between any two covariate patterns through calculation of time-dependent hazard ratios, hazard differences, and survival differences. The ideas are illustrated through a study of breast cancer survival and incidence of hip fracture in prostate cancer patients.